Whole Foods Market Gift Card | A Savings WOW! * HOT * $10 Whole Foods Market Gift Card – Only $5 Today Only! 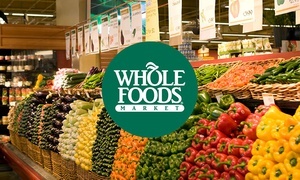 Today only, purchase a $10 Whole Foods Market digital gift card for only $5 on Groupon. Fine print: Doesn’t expire. Limit 1 per person. FINAL SALE; no returns. U.S. only. Do not present Voucher directly at Whole Foods Market locations; must present Whole Foods Market Digital Gift Card. The full value of the Whole Foods Market Digital Gift Card never expires. Don’t forget to check out our complete list of Whole Foods Market Coupon Matchups here or download the free Favado app for the list before you head out to Whole Foods!